2015: St. Martin’s Press, New York. It’s March Break, which means pajama days, which means days to read for hours on end. I curled up this morning with a find from Ben McNally Books, where I never fail to find an Anglophilic read, and even better, one I’ve not yet heard of. 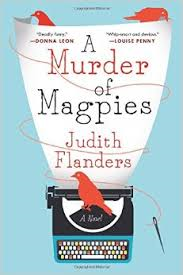 A Murder of Magpies is a murder mystery by Judith Flanders, best known for her work on Victorian lives and times. Her award-winning The Invention of Murder examined how the Victorians turned what was actually a rare crime into ubiquitous press and entertainment. “You have balls.” He looked at me as though he’d just paid me a compliment. Of course, in his mind, he had. I’d just never wanted balls. Silly me. There are supposed to be endorphins or whatever that make you feel great when you exercise. I don’t think I have any, because I only feel great when I’m lying on the sofa reading a book, possibly while simultaneously eating biscuits. That’s why I work in publishing, not athletics. Sam is about to publish a tell-all about the crimes and misdemeanours in a large fashion house, when the book’s author and her friend, Kit, goes missing. DI Jake Field comes to her office to ask about the death of a bike courier who was carrying a copy of the manuscript, and although he is at first dismissive of her concern about Kit’s whereabouts, things soon heat up on the action and attraction front. Sam’s mother is a very well-connected lawyer who completes the detecting trio, and together they take us through a quick and very pleasurable read. The book was riddled with improbabilities. No way would the detective on the case tell Sam so much. No way would a veteran editor but rookie crime-solver investigate and solve the crimes inside a fortnight. Now way is Sam’s mother so well connected. None of it mattered. I was completely willing to suspend disbelief because Sam is a hard-working, book-loving, feminist spark, and I loved her. I also loved the casual way in which she falls into a relationship with Jake in which neither of them play the other or get caught up in games. She’s just so smart in so many ways, and I loved her company. The book was published in England as Writer’s Block. Neither title works particularly well; there was no case of writer’s block, nor was there a discussion of collective nouns involving death, more’s the pity, but since it’s the story that counts, the titles are neither here nor there. The good news from England is that there will be more. A Bed of Scorpions will be published in England this week. Even better, it’s a campus novel. It’s ticks each and every one of the boxes in my list of highly desirables, and I will be on the lookout this time when it does cross the pond. Hold just placed at the library! It’s fun when a book is enjoyable enough that you can blithely ignore its flaws! And I’m glad to see this one is still worth my while, cause I am rather excited to read it. I hope you’ll like it, Jenny. I know that credible world-building is important to you, but I really was totally prepared to let the gaps go with this one. I am so excited to see what’s next for Sam, too.